A Linear Regression is a statistical tool used to help predict future price from past price. It's commonly used as an overextended indicator. A Linear Regression line is a straight line that best fits the prices between a starting price point and an ending price point. Look at this line as the 'equilibrium' price. A "best fit" means that a line is constructed where there is the least amount of space between the price points and the actual Linear Regression Line. 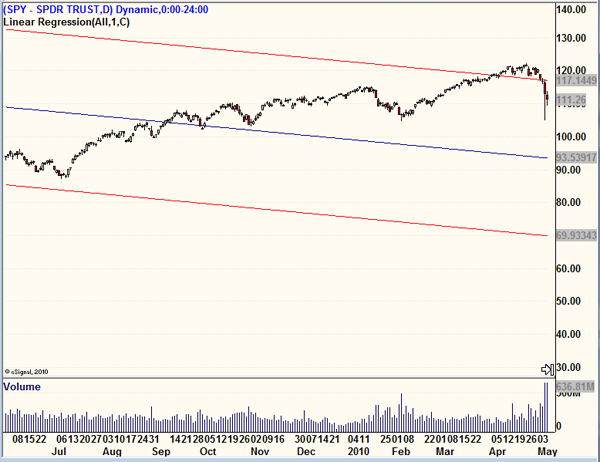 Any move above or below this line indicates more zealous buyers (above) or sellers (below). A channel can be made by using two lines that are a specific standard deviation above and below the Linear Regression line. When using Linear Regression traders may open a long position when price is below the Linear Regression Line, which could be determined as a good time to buy. On the other hand, when price is above the Linear Regression Line, it could be determined as a good time to sell short. Both the entry and exit signals are assessed by most analysts in context with both price and volume of the chart being analyzed.